Christine Kominiak, spokesperson for the company LuxeOrganix, has announced that the LuxeOrganix Argan Oil Shampoo and Conditioner are now available once again for customers to buy on Amazon. The LuxeOrganix argan oil shampoo and conditioner set is quickly becoming widely recognized as the premier solution to combat frizzy hair, which can suggest why Amazon sold out of the product so quickly. However, just recently, Amazon has restocked their shelves with the high demand product. Customers have been leaving postive reviews for the anti-frizz shampoo and conditioner, which surely has had an impact on high sales, as well. Bio Argan Oil, which originates from Morocco, to combat frizz, is a key ingredient, which helps hair become healthy and look more beautiful in appearance. The Anti Frizz Shampoo and Conditioner act as a modern therapeutic collection to help soften and moisturize the hair, and is achieved without using any harsh additives. The product contains no harmful sulfates, sodium chloride or parabens. "Helps my curly, frizzy hair immensely! Smooths my coarse blonde hair." Another posted, "Wonderful products! My hair feels wonderful and so much more healthy. No more static and it shines beautifully." 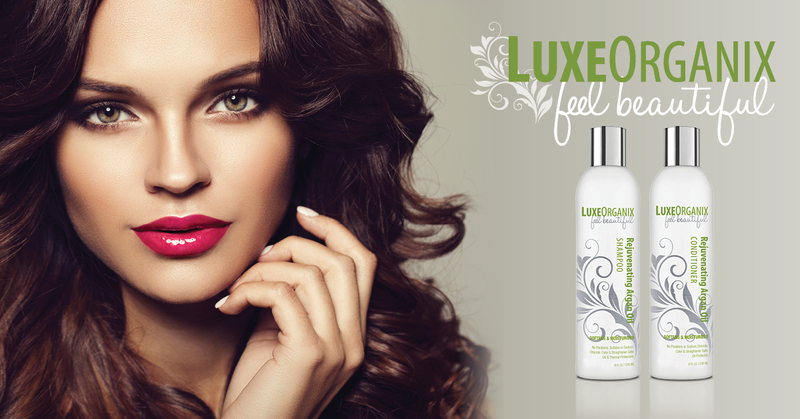 LuxeOrganix Argan Oil Shampoo and Conditioner are formulated to provide moisturizing volume and control. One of the ingredients contained is vitamin B5, which is known to penetrate through the cuticle of the hair. The company states that this will result in stronger, thicker and younger looking hair. "Celebrities such as Jennifer Lopez, Nicole Richie, Jessie J and Kelly Rowland (just to name a few) are describing Argan Oil as their daily hair care 'secret,' and for good reason.... Moroccan Argan Oil is loaded with fatty acids, making it one of nature's most effective anti-aging moisturizers. LuxeOrganix provides optimal moisture that is light and creamy, and balanced to give your hair the hydration it needs, without weighing it down or causing it to become greasy." A problem that some customers find with other types of shampoos is that they leave residue, which is usually in the form of a waxy film on the hair. LuxeOrganix said that their brand doesn't have this problem. They added that their shampoo and conditioner builds volume and conditions hair, and does all of this without any buildup occurring. Kominiak said that another feature her customers love about the anti frizz shampoo is that it doesn't dry the hair out like other brands do, and neither will the shampoo tangle hair or leave it brittle. The LuxeOrganix Rejuvenating Argan Oil Shampoo and Conditioner are made in the USA, using the highest quality ingredients, designed to make each customer feel like they just stepped out of the salon. The woman-owned business states that they are positive Amazon customers will love the results of their latest product, and to back this up, are offering a 30 day moneyback "No-Hassle" guarantee. For those who are interested in buying the LuxeOrganix Argan Oil Shampoo and Conditioner, please visit Amazon at the following URL: www.amazon.com/LuxeOrganix-Anti-Frizz-Shampoo. LuxeOrganix is designed exclusively for health-conscious women who want to Feel Beautiful without sacrificing their health. The company designs and markets luxurious natural and organic beauty products that are made with pride in the U.S.A; woman owned.